Hear about travel to London, England as the Amateur Traveler talks to Amber, an American Tour Guide in London, about her adopted city. Amber is an American expat from London who now takes people on walking tours of London. “I have lived and worked in London for about 12 years now and started tour guiding about 2 years ago and absolutely love it. I see London from a completely different perspective.” Both Amber and her husband always wanted to live in London. “It just feels like home”. This episode is part 1 of two. The second episode can be found at Travel to London, England part 2 – Episode 359. “I love working with people who have never been to a foreign country before and London is their first stop.” London is an easy first stop on a tour of Europe because the language is similar to what American’s speak and the history and culture are more familiar. “I call London the gateway drug to Europe. They try London out, ‘oh they speak English, yeah that might work and hey we managed to survive London and now we can go to Paris'”. Amber starts us on a virtual walking tour of London at Trafalgar Square and takes us through both downtown London and Westminster with stops at well knows sites like the National Gallery, The National Portrait Gallery, St. Martins in the Field, Westminster Abbey, Buckingham Palace, St James Palace, Elizabeth Tower (Big Ben), Fleet Street, St Paul’s Cathedral and more. We weven learn where the former Texas Republic once had its legation. We hear recommendations on inexpensive food in London, how to get around and how not to get around, and which sites will look familiar because of different movies. There is so much to cover on London and Amber was such a good guest that this will be a two part episode with Amber joining us again in January. Tokyo meetup in Japan the week of January 12th? What surprises me the MOST is that people still believe the myth about London and boring food. I suggest anyone who still believes this myth ride the Tube or buses to Chapam Common High Street and do some walking. To start it has one of the more interesting Tube stations, a classic Holden and a nice inter city park (the Common) But, walking along the High Street about four or five block long, you will about find fifty restauants, and non are fish and chips, or a McDonalds et.al. My favorite budget place to eat in London is Nandos, They now are located all over London, but until the last two or three years they were none in zone 1. It’s food is tastely, not great, not a rip off. A quarter broiled checken with a large greek type salad and unlimite soft drink will cost less than nine GBP. You order like McDonalds and you food is delivered to you table. This is Chris Bogdon who did the Pittsburgh episode with you about a year ago. Your timing on London a bit off. LOL I was in London for 2 weeks after Thanksgiving and I wish you would have done your show two weeks prior. I did a lot of what your host suggested but would have took a couple of her suggestions. Anyway, I thought I would post to your my thoughts. I stayed by Heathrow since I was there for business, however, I would recommend the Pheasant Pub in Hays. This pub is an old pub that is within walking distances to most of heathrow’s airport and is a family run business that is a great alternatives to the hotel food. I went to the Tower Bridge and the Tower of London and unfortunately I fell into the tourist trap of eating at the restaurant underneath the Tower Bridge outside the Tower of London. I’m not sure the name but I think it was connected to both sites. The food was overpriced, small portions and was unimpressive. The second day a guard at the Tower recommended the Dickens Inn. It was east from the Tower Bridge about a 5 minute walk and was a charming pub/restaurant that was owned by Charles Dickens grandson. Abbey Road was awesome to see. For all music fans, taking a picture on Abbey Road is really cool and seeing the studio that created so many recordings was amazing. I only wish there was a tour of the studio. Harrod’s department store was also amazing to see. It reminded me of a Macy’s in NY but on steroids. Even if a person doesn’t like shopping, Harrod’s is amazing with the decorations and the food available on the first floor. I wish I would have went to more museums, but I only had a few days since I was there for business. Anyway, thanks again and keep up the great work! Places to stay: I would not stay any place outside of tube zone 1 (here’s a tube map for reference http://www.london-tube-map.co.uk/ ) You don’t get to London very often and there is just to much to see and do to spend a bunch of time on a crowded daily commute. Plus some of the outer areas are not the safest places. Whatever you do don’t say in Brixton. I’ve heard bad stuff about that place. In 2003 we rented a flat near Marble Arch which worked out well. But a flat costs more and is really over kill unless you want to cook your own food, which I would not do. There are too many cool places to eat. In 2008 we stayed at the Gower House Hotel ( http://www.gowerhousehotel.co.uk/ ) The Gower House is a “budget” family run place near The British Museum . The rooms aren’t much but they are clean. It’s fine if your looking to save a few pounds on the room. It looks like an en suite double room is currently £75 a night. You likely won’t be spending much time in the room anyway. A good breakfest is included and they are located just a block away from the Goodge Street tube stop. Plus there is a bus stop almost directly across Gower street. One route is just a few stops (3 or 4 I think) from Trafalgar Square. I liked the people that run the place too. We got there a day late thanks to USAir and they didn’t charge us for the missed night. It could work for you. But there are a lot of similar places in zone 1. Check out pictures of our room here ( http://www.london08.randylmartin.com user=guest pw=2seepics ) The Bus picture is from the front door of the hotel and the bus in the picture is at the stop that you would pick up the bus for Trafalgar Square. If you go here try to get the courtyard room on the first floor. Most of these kind of places don’t have elevators and the Gower House is no exception. Courtyard rooms are quieter than the rooms that face the street. Another place that I think I would like to stay at is Premier Inn London County Hall ( http://www.premierinn.com/en/hotel/LONCOU/london-county-hall ). They currently show room only rates (No food) starting at £69 which may be for just a single. They do have elevators and a super duper location. It’s right next to the Eye and the Waterloo Train Station and near Parliament, Big Ben, Westminster Pier, 10 Downing Street, Westminster Abbey, Westminster Tube Station and a bunch of Bus Stops. Transport: You’ll want to get an Oyster Card before you start riding the Tube or Bus systems. They have an option that lets you ride ride the Tube & Bus systems all over zone 1 & 2 as much as you want for a fixed price for 7 days. 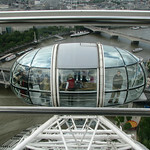 It also is good for discounts on some train and river cruise trips around London. See Rick Steve for more detail here ( http://www.ricksteves.com/plan/destinations/britain/londontransit.htm ) We used the hell out of this thing. With the all you can ride option we sometimes used the bus to go just a stop or two to get to the tube. If you come into Heathrow you can ride the tube all the way into town. But Heathrow is outside of zone 2 so if you buy the 7 day card, that ride would be discounted but still cost extra. If you land at Gatwick a train or bus ride is involved. The Gatwick Express is the fastest train. The Southern Railway (two stops) is the cheapest. Both take you to Victoria Station. Telephony: The deal for local phone service over there is to get an unlocked cell phone ( I have one that I can loan you if you want. ) and buy a sim card from a local provider once you get there. The best deal I could find in 2008 was with Virgin Mobile. I think it was about £15 which gave us plenty of talk time and coverage was total. I think I still have the sims too. If they still work you could just top them up and maybe save a few pounds. Places to eat: I think the best deals in food are found in the Pubs. They are all over the place. The most interesting one we went to was Ye Olde Cheshire Cheese. It was rebuilt in 1667 after the fire and has had quite a few famous visitors. Check it out here: ( http://www.pubs.com/main_site/pub_details.php?pub_id=154%22 ). There are all kinds of options though. It’s like New York in terms of restaurants. Adjusting to the time: You will be flying overnight landing in London around sunrise losing 5 hours in the process. If you want to adjust ASAP and get the most out of your time there, you should stay up until 9PM on day of arrival. It’s not easy to do but it should put you on track for the rest of your trip. I set up an evening walk the last time. It was still very difficult to make it to 9PM. But we did and the other days we were more or less on a normal schedule. **** I liked the cruise from Westminster to Greenwich. At Greenwich you can check out several things including The Royal Observatory.